This coming August could be a pivotal month in the reformation of the forest industry on Haida Gwaii, formerly known as the Queen Charlotte Islands. An announcement is anticipated during that month for timber allocation among the remaining licencees on island from a new and reduced annual allowable cut of 929,000 cubic metres, as determined by a joint council representing the Haida and the British Columbia government. With protected areas of various descriptions now occupying more than half the landmass of Graham and northwestern Moresby Islands, divvying up the annual cut will help determine the long term viability for off island-based forest tenure holders. Taan Forest should have no concerns about its future. The company is a subsidiary of the Haida Enterprise Corporation (HaiCo). The corporation’s mission is to generate a diverse, functioning and sustainable economy on Haida Gwaii for the long term well-being of the Haida people and culture. HaiCo’s board of directors reports directly to the Council of Haida Nation on the islands, located about 150 kilometres off B.C.’s northern coast. Taan—which means bear in the Haida language—has a forest licence and a TFL once held by Western Forest Products and managed cooperatively. 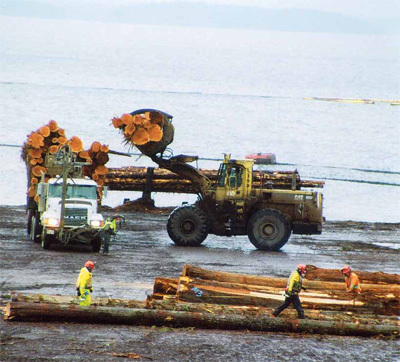 “Between those tenures, Taan expects to have an annual cut of plus or minus 450,000 cubic metres,” predicts Mike Richardson, general manager for Taan Forest, which is located in the town of Skidegate, on Graham Island. Taan Forest is a new company which received its forest licence in 2011. “We’ve purposely started very slowly,” points out Richardson. It’s been a case of ensuring the foundations are in place. That includes solid engineering and planning to understand the nature of the new operational landbase. 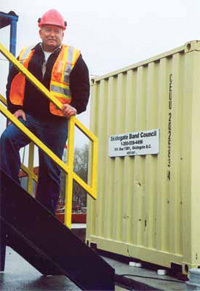 Mike Richardson, general manager for Taan Forest. One of HaiCo’s key objectives is to provide jobs for Haida people. Recruiting and retaining workers in the forest industry is a huge challenge on islands with a total population estimated at only 5,000 people, adds Richardson. HaiCo has a skills development coordinator who works with all ages of Haida to develop employment opportunities in forestry, tourism and aquaculture. One of the compensations for the logging industry operating on the isolated, high-cost islands was access to higher valued logs. “With land use plans and other exclusions, the land base has shrunk. We don’t have access to old growth, a lot of that is protected now,” he explains. The emergence and vigour of the Chinese wood fibre market has produced a lifeline for white wood during Taan’s early days. “Major licencees never wanted to do too much on islands, barging the wood south where their infrastructure was located,” continues Richardson. Taan takes a different tack and wants—where feasible—to add values to logs on Haida Gwaii before shipment to markets. “If we can do something with a log on island with secondary manufacturing, we will. There are no stupid ideas. Efforts to create jobs on Haida Gwaii include a pole peeling plant in a joint venture between Taan and the Skidegate Band. The plant was initiated by the band, is expected to cost in excess of $500,000 and is located at the Ferguson Bay Dry Land Sort overlooking Masset Inlet. The plant is expected to employ four people and is to be powered by a new Cat generator. Taan Forest, through its licences, supplies the plant with logs and manages the project. A cedar log fetches regular domestic prices in Vancouver, but as a pole, the price almost doubles. “And we have a lot of ‘em,” notes Richardson. 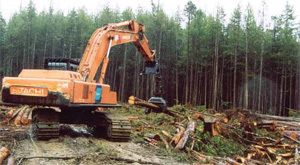 Taan Forest is a subsidiary of the Haida Enterprise Corporation (HaiCo). Taan—which means bear in the Haida language—has a forest licence and a Tree Farm Licence once held by Western Forest Products. He sees some form of bioenergy development on the dry land sort in the future. “It’s another piece of the puzzle.” Expensive power generators are the islands’ existing source of industrial power and a major investment consideration. Logs are transported by barges, built of one specie, to speed cash flow. Capacities are around 17,000 cubic metres for white wood destined for China and 19,000 cubic metres of cedar mainly destined for markets on the B.C. coast. Wrapped poles from the new plant will be shipped in 5,000 cubic metre loads on separate barges. The isolation of Haida Gwaii and associated costs stimulate resourcefulness. For example, the availability of rock for road building can be an issue on the east side of Graham Island. There’s too much clay and when rock is located, blasting is expensive. “We re-use rock where we can maybe two or three times. We leave enough for access for planting and silviculture,” explains Richardson. Planting tree seedlings after harvesting reflects the species profile on the land. When cedar is re-planted, the seedlings require the protection of plastic tube shelters from predation by the prolific deer populations. The slow growing seedlings will be killed by the deer without the expensive form of protection during their early critical growth cycles, explains Richardson. Efforts to create jobs on Haida Gwaii include a pole peeling plant (left, under construction), a joint venture between Taan Forest and the Skidegate Band. 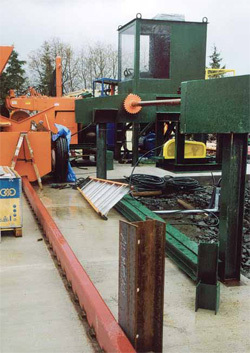 Taan Forest, through its licences, supplies the plant with logs and manages the project. Taan Forest has been quick off the mark to achieve Forest Stewardship Council certification. 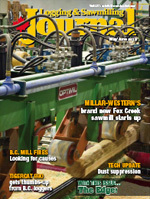 The company has already been successful at custom cutting red cedar products under its distinctive Haida brand.